With the Holiday Season right around the corner there are safety issues that are lurking around. Thanksgiving, Christmas Eve and Christmas Day rank as the peak days for kitchen fires as well as other safety problems. We get so wrapped up with the hustle and bustle of cooking, cleaning and shopping that we overlook day to day problems that could arise. Here are some Holiday Safety Tips to get through the season safely. Decorating – Your up on that ladder putting up the beautiful Christmas lights and lose your balance – one trip to the Emergency Room changes everything. Use caution when up on the ladders and don’t stand on small chairs or stools! If you have small children keep plugs out of their reach as well as decorations that might be breakable. What those fire risks – One of the biggest Holiday Safety Tips we have to you is to watch the water in your live tree. 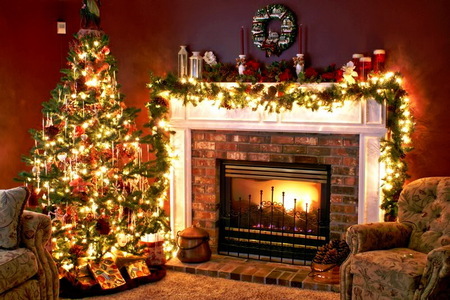 Check those tree lights for exposed wiring or shorts and certainly keep your tree away from your fireplace. Never leave candles unattended or light in reach of children. The dreaded “shopping” – While shopping, Watch your Surroundings!!!! Always park in well lit areas and don’t leave your shopping bags in view in your vehicle. Lock those gifts in the trunk. Avoid carrying a large amount of cash and check your bank accounts daily in case of fraud or identity issues. Thieves love to do their own shopping with your card during the holidays. While on your way to the In-Laws – Watch for “aggressive drivers” and watch for ice and snow on the road and drive accordingly. If you plan on having an “adult beverage”, find someone to drive you home. The Police are out and watching so that they can protect YOU and Others from drunk drivers. Cooking Holiday Safety Tips – Where to begin??? Don’t leave your stove or burners unattended. Keep kiddos out of the kitchen while you are playing Betty Crocker. Keep your kitchen towels and napkins away from the oven or burners. After the “Hoop-La” – Do throw those leftovers away after a few days and don’t leave the food out for “grazing” longer than 2 hours. Wash those hands every time you touch food as not to contaminate the food while cooking it and make sure that meat is cooked thoroughly. Many of the Holiday Safety Tips mentioned are common sense however when you get busy, you certainly can make some mistakes that you normally wouldn’t make. Make the most of your family and friends this Holiday Season and stay safe and smart. Happy Holidays!! !